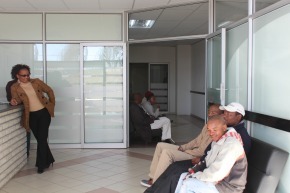 A nondescript clinic in an industrial area of Lesotho’s capital is the perfect venue for older men to discreetly participate in HIV prevention services, including voluntary medical male circumcision. Maseru, Lesotho—Walking down a busy street in the industrial area of Lesotho’s capital, Maseru, no one would know that the Apex Medical Clinic was actively attending to patients. The sign at the entrance consists of a large turquoise-and-white-striped window with the clinic’s name simply written in blue. The modest appearance is purposeful—a strategic approach to increase the number of older men participating in free voluntary medical male circumcision (VMMC) services. A key HIV prevention strategy across east and southern Africa, VMMC has become popular among young men and adolescents. The same has been true in Lesotho, a small country only slightly larger than the state of Maryland and nestled in the center of South Africa. Despite its size, Lesotho has the second-highest rate of HIV prevalence in the world, with the number of people living with HIV close to 360,000. The adult prevalence rate is 23 percent and many HIV prevention programs are focused on men ages 15–24. Men older than 25 have been reluctant to participate in VMMC programs because of their apprehension about the procedure and the prospect of intermingling with younger clients. Recognizing this gap in prevention services, Jhpiego, in partnership with the Ministry of Health, looked to provide a comprehensive package of services in a discreet, yet welcoming, setting for these men. The Apex Clinic—supported by the U.S. Agency for International Development’s (USAID’s) flagship Maternal and Child Health Integrated Program (MCHIP)—opened in June of 2013. Easily accessible to many who work in the area, the clinic’s setting has appealed to older men, and since its opening, it has served more than 1,900 clients. The clinic is one of 13 health facilities to offer a comprehensive service package that includes both group and individual counseling and free VMMC services. At each of these VMMC facilities, trained health professionals offer information on the VMMC procedure in addition to discussing broader topics such as sexually transmitted diseases, HIV prevention, partner reduction, substance abuse, gender violence and family planning. Since 2012, when MCHIP began working with the Lesotho government on its HIV prevention strategy, more than 43,000 men and adolescents have been circumcised through an integrated service approach. 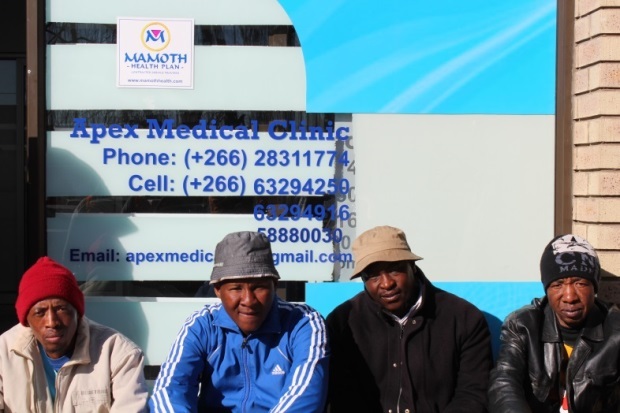 The establishment of the Apex Clinic was an innovative way to ensure that all men received services. Malijo Baji, a counselor at the Apex Clinic, explains the positive impact of a comfortable setting that affords more privacy than the customary VMMC campaigns that are held in public facilities. HIV/AIDS Counselor Malijo Baji uses her personal experience to encourage older men to participate in voluntary medical male circumcision services. “For ages, men in Lesotho have been hesitant to go for HIV testing, but now because of VMMC services, they’re coming with renewed strength and many of them are [getting tested] for the first time,” said Baji, an enthusiastic advocate. Part of Apex’s appeal lies in the simplicity of its design, urban location and convenience for clients. “There are no appointments, so we can come and go in one day, since many of us have jobs,” said one client. Clients, many of whom rarely access health care services, also appreciate the all-inclusive approach. “We knew about HIV before coming for VMMC, but here we received new information and our questions were answered,” said another client. The service at the USAID-supported VMMC sites has also been linked to the increased willingness of men to be tested for HIV. On average, 73 percent of women 25–49 years of age in Lesotho test for HIV compared to 48 percent of men in the same age range (Lesotho Demographic and Health Survey 2009). But in the Apex Clinic alone, HIV testing rates are 96 percent, and nationally, HIV testing in VMMC facilities is 76 percent. Baji personifies the Apex Clinic’s commitment to helping prevent transmission of HIV. She has built a career around empowering others to take control of their lives. Baji is HIV-positive, and since learning her status in 1999, she has talked about her experience throughout the country in an effort to help others in Lesotho. Recently, Baji was honored by the local radio station MoAfrika, which presented her with the MoAfrika Women’s Award 2013 in the category of HIV/AIDS. She was nominated by her peers and over 700 people voted for her.